Welcome to Tom's Bulldog Automotive, your local auto repair shop in Coos Bay and North Bend. Acting as the first line of defense between you and the Coos Bay roads, properly maintained brakes are essential to a safe drive. Our ASE certified technicians perform a wide range of Brake Repairs, and we'll have your car braking like new! Is your engine making strange noises? Automotive engine systems can cause complicated and frustrating issues. Our auto repair shop offers everything from basic maintenance to major Engine Repair and diagnostic services. No matter what your transmission needs, you can have complete confidence in our experienced technicians to recommend the right Transmission Repair or service for the right price. With each passing year, new vehicles include an ever-increasing number of electronic components. At Tom's Bulldog Automotive, we can perform just about any Auto Electrical Service. "I would tell them about the high Professionalism, high work.."
"Good work it seems..maybe a little spendy ..also had to.."
"They are very thorough and honest. They are very hospitable.."
"This is the best automotive shop in the area and.."
"That you will find no other customer service care like.."
"They do excellent work and provide exceptional communication at every.."
"Excellent customer service and very thorough. Progress could be made.."
"Trustworthy, personable, professional, and helpful. I will always recommend these.."
"Work was professional on time and a very reasonable price." "I would tell them, it's the only place to go,.."
"Tom and his staff really care about me and my.."
"the people that work here are friendly and go out.."
"We were very pleased with the thorough quality of the.."
"They are serious about quality work performance and create a.."
"Quality of work EXCELLENT , status of auto in work.."
"I have recommended Tom’s Bulldog Automotive service to numerous people,.."
"Tom is a straight-up guy and is super easy to.."
"They dont just see everyone as a customer, they get.."
"Very thorough, comprehensive, and quality work is done at Tom's Bulldog Automotive!" "From experience in the past they have done quality work..."
"High quality of work, with a high cost of service..."
"I have been using their business for my repair needs.."
"If you want someone thorough, who stands behind their work,.."
"They did a fantastic job! Everyone was very friendly &.."
"They are very helpful and do everything to make sure.."
"Thorough, friendly and I trust their service"
"Tom and his crew did a great job. Both their.."
"Go there. Go there now!" "I only take my vehicles to people I trust and.."
"Really good guys who care about their clients." "this is your new up to date full featured repair.."
"They are great to work with and very accommodating. .."
"Amazing customer service! I will never go anywhere else in.."
"Great Customer Service! Tom always makes me feel important and appreciated." "They do very thorough work. Probably not the cheapest shop.."
"They run a quality shop." "Bulldog is the only shop in the area willing to.."
"Always does a great job with great client service. .."
"Very thorough. Get the job done." "Give them a try I was very satisfied with their service." "Tom's Bulldog Automotive impressed me very much on how they.."
"They're very professional and highly qualified for automotive repairs and upkeep." "Great family service center environment and professional business. Far exceeded my expectations"
"Excellent customer service, reliable, and dependable. I never worry.."
"I'm always well informed of what my car's issues are.."
"Vehicle was purchased in inoperable condition. 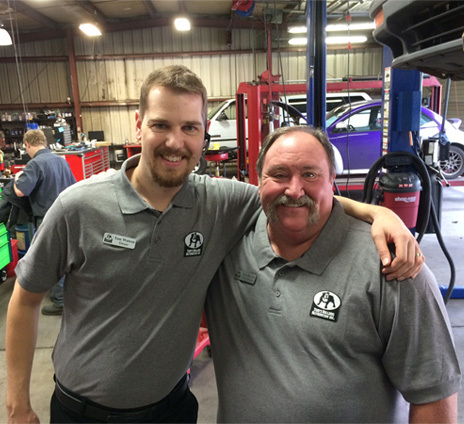 Tom's staff were able.."
"Great service, attitude and professional." "I was very pleased with their thoroughness, timeliness, and cleanliness..."
"I would say that I found the quality and customer.."
"I would tell them that Tom's is amazing. They are.."
"Outstanding. Honest, dependable, knowledgable, efficient and guarantee their work!" "That I have been totally satisfied and they should give.."
"Always treated me with respect." "It's a great place to take your vehicles because they.."
"Tom's Bulldog auto goes above and beyond helping get you.."
"reasonable pricing, excellent workmanship,friendly service rep and detailed information as.."
"You can not find a more professional, honest, and courteous.."
"Gave me complete and accurate details on the repair of.."
"Excellent service, keeps u updated on progress of service, friendly atmosphere"
"I would tell them to use Bulldog Automotive"
"Excellent customer service - more than I have ever experienced.."
"Bulldog goes out of their way to make the the.."
"Very professional -fair and honest which is hard to find.."
"We highly recommend this business. We have found them honest,.."
"Great service and wonderful staff"